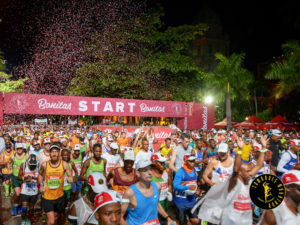 South African runners are striding head long into the marathon and ultra season, but how do you make the most of the long runs to maximize the training yet still walk away with a good time? Are you a novice? This will give you the most pleasant introduction to the new distance. You looking for a fast time? What I am describing will see you running faster at the finish than you were at the start! It’s as easy as 1-2-3.. Since my very first Comrades Panel talk at Natal Newspaper house in 1986, I have been a promoter, and supporter of mixing running and walking and have used this myself in many of the 100 mile, multi-day and my 6:07 25th place (24th if you take away the first lady 🙂 Comrades. Equally, I have used it with Comrades Gold Medallists, 100km, 24 hour, marathon, 21km and 10km World, SA, National, and Provincial athletes, some of whom have earned medals, podium places as individuals or teams. The list of runners, and triathletes, who have benefited from the run and walk advice is considerable. Even sub 20 minute runners have recorded PB’s with a walk at 3km into a 5km! Without spending too many words on the detail, splitting a distance up with periods of running with short, determined, and planned walk breaks will bring: an extension of your endurance capability, improve overall pacing, make for better hydration and energy intake, psychologically reduce the distance into bite-sized sections, and, importantly, result in faster overall times. BUT now imagine running a 3:30 marathon with a longest run of 13 minutes, but getting faster as you head into the finish! Since 2004 the amount of travel has increased dramatically, resulting in long hours stuck in ‘cattle class’ airlines, sitting behind a screen and hours of cramped travel both local and international. I was losing the movement in 3 key ‘hinges’ – the ankle flexion, the knee, (also destructed by shortened hamstrings and tight calfs), and vitally, the hip / lower back. As a specie, we have significantly reduced the amount of movement in the lower back and this has a ‘trickle down’ effect on gluts, hamstring, calf and Achilles. With around 50 local flights and multiple intercontinental trips, and only 75 nights at home last year and 82 nights in 2016, flexibility and functionality becomes compromised, and jet lag and travel fatigue reduce circulation and the ability to get into a fluent running style on arrival. Not only did I find that a basic set of yoga based movements provided relief, (that led to a better appreciation a human stretch – a later article), but also that by mixing run and walk in a gradual escalation of distance, my warm up AND, by body “release” was smoother, more natural, and more effective. Click here to watch my view of “The Human Stretch” assisted by Angie Mullar from Hout Bay. As a result my training, particularly the day after intercontinental travel, began with the yoga, then run 1 minute, walk 1 minute, run 2 minutes, walk 1 minute, run 3 minutes, walk 1 minute, run 4 minutes, walk 1 minute, and then only try anything longer. Immediately it was noticeable that this brought my heart rate up in a more controlled fashion and produced a far more compatible warm up, and the core run time was of higher quality, with a stronger finish. This was passed onto runners I assist, and then expanded further. As I reduced the run time my heart rate took longer to get to the limit, but my pace was able to increase. I was getting faster as the time proceeded. Of course, this resulted in a positive mind set- which resulted in a faster pace – resulting in a more positive mind set …. An upward spiral of performance enhancement. From being tired, tight, and limited in pace two hours earlier, I was fluid and flying at the END of two hours 10 minutes of running, and had covered more in the second hour than the first. That final 3-2-1 was almost sprinting – and certainly I would have been able to run them like a track session had that been a requirement. This process was shared with a number of runners I assist and most reported similar experiences. Then it was time to test on a marathon and similar results were experienced. For example, if you want to break 4 hours for a marathon, you simply use the count up to 14 minutes run, have 2 minutes of walking, and count down from 14 minutes to 1 minute run – oh and OK you can also run the last-minute walk – but actually you will be flying!!! Consider the paces: to run a 4 hour marathon requires an average pace of 5:40 per km. This system requires a pace of 5:17 per km, but provides 28 minutes of walking at an easily achieved stride. Even if you are targeting a PB at 4 hours, you need to be capable of a 50:30 for 10km which is a 5:03 per km pace. That’s 14 seconds per km faster than you require in this marathon and yet you only ever run for 14 minutes twice without a break!! This works on so many levels: It extends the capacity of energy systems, it reduces muscle fatigue, it reduces risks for those recovering or battling with injury thanks to a regular change of muscle use; It provides regular recovery of heart rate, respiration, and promotes better hydration and energy consumption; It reduces the period of effort as the risk of fatigue increases; and it has a positive psychological impact. It gets even better for Ultras: a sub 6 hour Two Oceans requires you only to count to 17 and a 10 hour Comrades is in your grasp by counting to 23 and back! How would this method work if you could only run at 6:30 per km?